The toddler years are a magical age of boundless curiosity and sensory exploration. We’ve compiled a list of the top 24 must-do activities with your toddler, ranging from sweet and simple to those that require a little more preparation (but are totally worth it!). Taking toddlers to the beach can be an overwhelming, tear-out-your-hair experience, but don’t forget that there’s more to the seaside than sandy nappies. Walk down the beach from the lifesaver flags, and discover the rockpools. They’re usually a lot quieter in terms of crowds, the water is shallow, and there’s lots of starfish and crab-spotting opportunities. Toddlers love feeling textures of new things, so why not use what’s already in your kitchen? 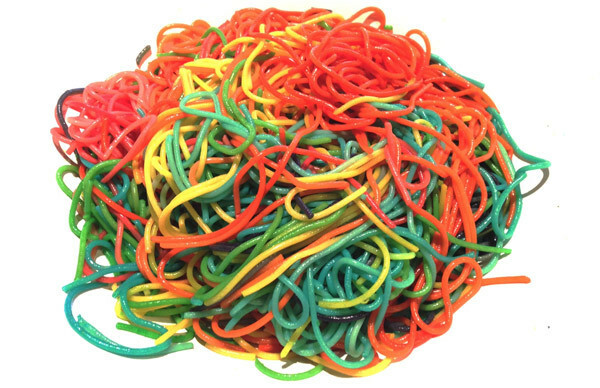 Boil up a batch of rainbow spaghetti or coloured rice and create some colourful sensory tubs for them to explore. Help your toddler understand the world around them by practising consolidating the colours they’re learning. You can whip up an easy and cheap colour sorting game using craft supplies like the tiny coloured pom poms you can buy at a two dollar shop and some different coloured plastic plates. It’s healthy for your kids to get muddy. Even scientific studies say dirt is good for their mental and physical health, as well as providing awesome opportunities for imaginative and role-based play. To make a mud kitchen, simply grab old pots and pans and put them in the bottom corner of your garden, where it gets muddy after the rain. A quick Pinterest search for mud kitchens will get your creative juices flowing in no time! Sometimes the simplest things are the best, and nothing beats the magic of gazing at the night sky, full of twinkling stars and planets. While you’re looking at the sky, lie on the grass and watch planes fly overhead. This is easier in the daytime, and if you’re under a flight path, but it’s a nice time waster if you’ve got a toddler who’s plane obsessed (like mine is!). Nature is an incredibly calming environment for wound-up toddlers. Little legs have a tendency to get tired very quickly, so bring a baby carrier or better still, a bigger hiking backpack. 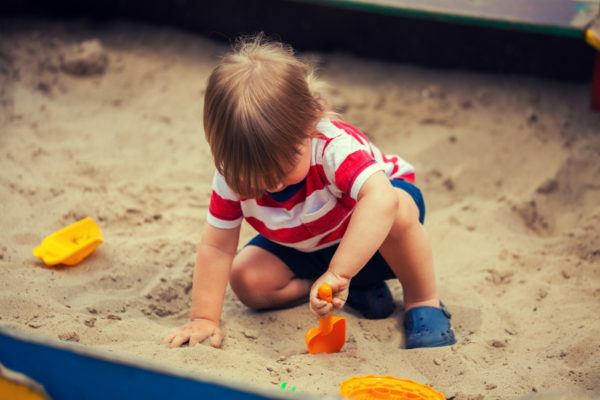 Toddlers are often fascinated by sand and can play for 10-15 minutes just letting it run through their hands. Bring along a toy truck and buckets and spades, and they’ll be content for an hour or so! This is a fail-safe solution for even the foulest of toddler moods. Just pop on your favourite Spotify or Pandora playlist, a silly scarf or hat (optional) and boogie around the room. Movement helps relieve physical tension and let’s face it, they’re burning up energy, which can only be a good thing! Take painting to a whole new level by freezing non-toxic paint in ice cube trays and making paint popsicles. Stick a popsicle stick in the end of each one for a handle little hands can easily grab on to. Grab a funny hat, a pair of sunglasses and a feather boa, and play dress ups. This works well before the dance-party option! Go for a walk to the local park or along your street and take a plastic container or tub to collect the natural things you find. Talk about what you’re picking up and describe the colours and textures to your toddler. When you get home, you can sort them into colours, shapes and sizes. It sounds simple, but balls are one of the best toys for toddlers, because they come in many shapes and sizes, and there are so many ways to have fun with them. Roll the balls through some PVC pipe, bounce them through a hula hoop, or stack them inside a container. 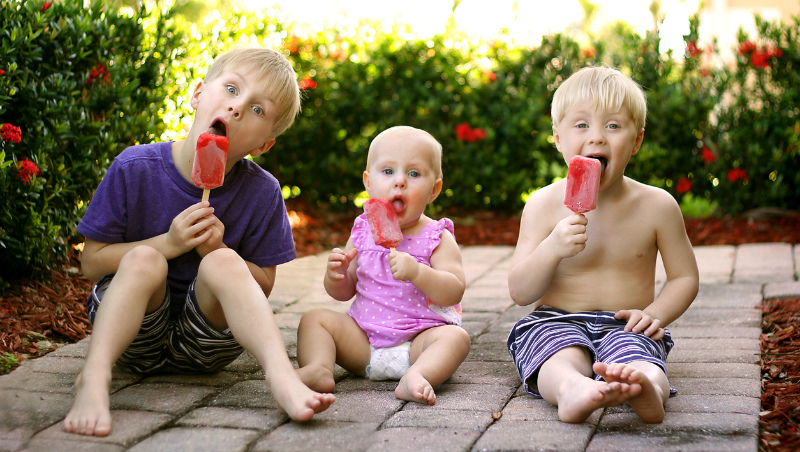 Make homemade ice blocks from fruit, juice and yoghurt and enjoy outside on a hot day. Frozen bananas on paddle pop sticks are cheap and easy option as well. You can make your own liquid chalk recipe with equal amounts of water and cornflour and use food colouring to get just the right hue! It creates hours of spellbound entertainment and can be easily washed off afterwards as well. You’ve mixed your own paint, now make some paint brushes too, using leaves, ribbon or sponges and pegs. Just about anything that you can grab in the end of a peg can become a paint brush of sorts – why not try with some feathers, leaves and twigs of rosemary to get started? 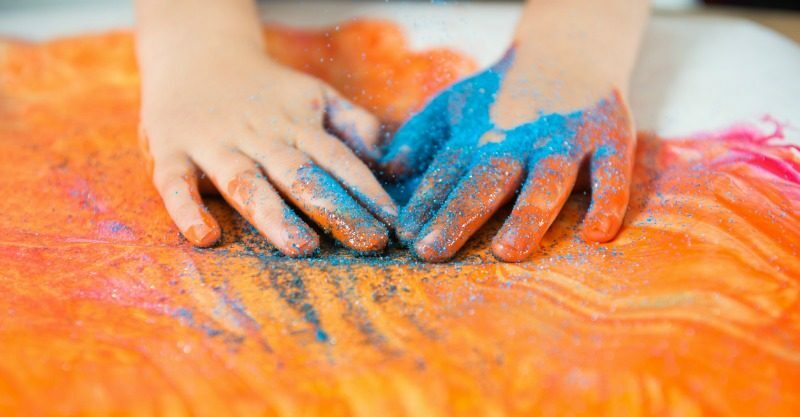 Having little hands helping in the kitchen slows down the process and makes a mess, but the fun you’ll have is worth it. Pop your toddler in a high chair so they can see what you’re doing, and let them help you pour and mix. Use a simple recipe like play dough or pikelets. Water is free, refreshing, versatile, and makes for some wonderful play opportunities. We have heaps of fun and creative ideas for water play. 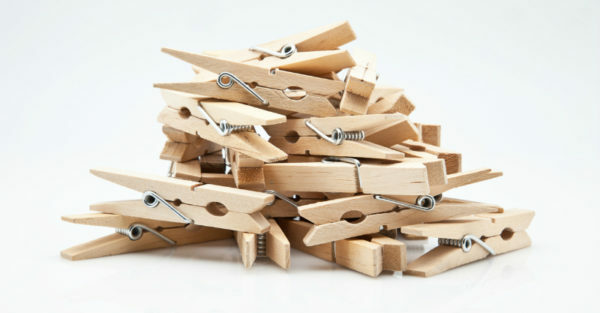 Gather some readily-found household objects and some string or pipe cleaners, and show your little one how to thread. They could try beads, cylindrical pasta (penne or rigatoni), cardboard (cut up toilet rolls) and bottle tops (with holes punched). This is as easy as it sounds. All you need are some pipe cleaners and a kitchen colander (saucepan with lots of holes in it.) Show your little one how to push the pipe cleaners through the holes, then make a cup of coffee and put your feet up… they’ll be entertained for a while! Find a clear water bottle or plastic container and fill it with small stones, buttons, beads or bottle tops and voila, you have a rattle! Tape the lid so that the small contents inside (choking hazard) don’t fall out. One of the simplest ways to keep an energetic toddler still is to use the magic of contact paper. Simply stick it sticky side up to a flat surface (using sticky tape around the edges) and give her lots of small objects, scraps of fabric, wool, ribbon and paper to play with. Never underestimate the joy found in the simplest of activities. Take some corn, frozen peas or oats and help your toddler throw small handfuls to the birds. It’s a great solution for the late-afternoon grumpies. Just steer clear of feeding bread to ducks – too much of it can be bad for our feathered friends. All toddlers go through a stage where they want to tear down every castle you make them. And then they reach that magical age (between 16-20 months) where they want to build things up! Hurrah. What’s your favourite toddler play activity? Do you have anything to add to our list?